Home » Our Thinking » How Can We Redesign Our Thinking? When it comes to design, we often think of a drawing, or plan, that often pertains to architecture, graphic design or images. Taking this understanding a step further, we can apply design thinking to our daily work to improve results. 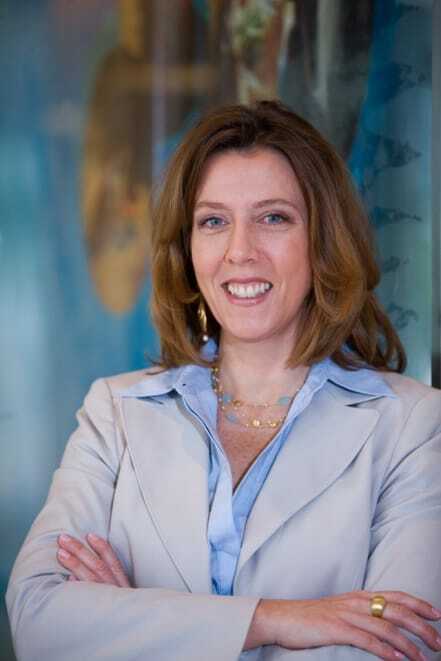 To learn more about design thinking, we spoke with Kelly Chmielewski, CEO of The Possibility Shop and former executive at PBS, who will be presenting at DC Communicators in September. What is design thinking, and how do you start the process of it? More than anything, and different from a start-to-finish linear process, design thinking is a mindset and a set of tools for problem-solving and innovation. This approach is also called human-centered design. That’s because a design thinking journey is always focused on the person or people we’re designing for. We start with the needs, wants, hopes, challenges and perspective of our customer and we keep this person (or this group of people) top of mind no matter where we are in the life cycle of a project. We want to know that customer deeply, as a whole person. How do they see the world? What are their biggest challenges? What brings them joy? We need to be truly empathetic to their point of view. THEN we can think about the specific problem we’re trying to solve or the opportunity we want to explore—in other words, where and how our brand/product/offering adds value the lives. Of course, sometimes the specific problem we’re trying to solve is the catalyst that leads us to the design thinker’s toolbox, but we can’t tackle that problem without a deep understanding of our customers, so it always comes back to them. What is the most difficult part of design thinking? The hardest part about design thinking is that we often start or evolve a project without knowing exactly where we’re going to end up. And we’re likely to stumble along the way. Some design thinkers call this “failing fast.” This means make your stumble, learn why you stumbled, then get right back up, brush yourself off and carry on. The very thought of this is uncomfortable for people. It was for me, at first, and sometimes still is! But when you have faith in the approach, it works, because it’s rooted deeply in what our customers value. We benefit most from design thinking when we learn how to be comfortable being a little uncomfortable. Recall a time when it was particularly difficult to evolve a brand to meet the changing needs of customers. What were some of the obstacles you encountered? .PBS is one example. While the company was making lots of technical changes to meet customers on their terms, those customers, who PBS calls viewers, didn’t even realize it. Peoples’ perceptions of PBS matched past viewing experiences, when they watched on television sets (remember those days?). They thought of PBS as an out-of-date legacy broadcaster. In reality, PBS was delivering content on more than 20 platforms and as many devices as you can name. Our challenge was to prove that PBS was an innovative media company, changing along with the rest of the market, sometimes leading the market—and therefore still relevant for people. There were three huge obstacles: outdated perceptions based on peoples’ past viewing experiences; stiff competition for new content from streaming platforms; and a 24/7 digital world competing for peoples’ attention generally. As a result of a design thinking-based innovation lab with the participation of PBS staffers and thought leaders from affiliate stations around the country, we came up with the idea for a brand experience that included a mobile pop-up lounge where people could come, in person, charge their devices and play with tons of other devices pre-loaded with PBS content and apps. The lounge, called PBS Anywhere, was the centerpiece for the first experiential brand campaign in more than 10 years and proved to be an effective way of raising awareness of PBS content on multiple platforms—which led to a positive change in brand perception. 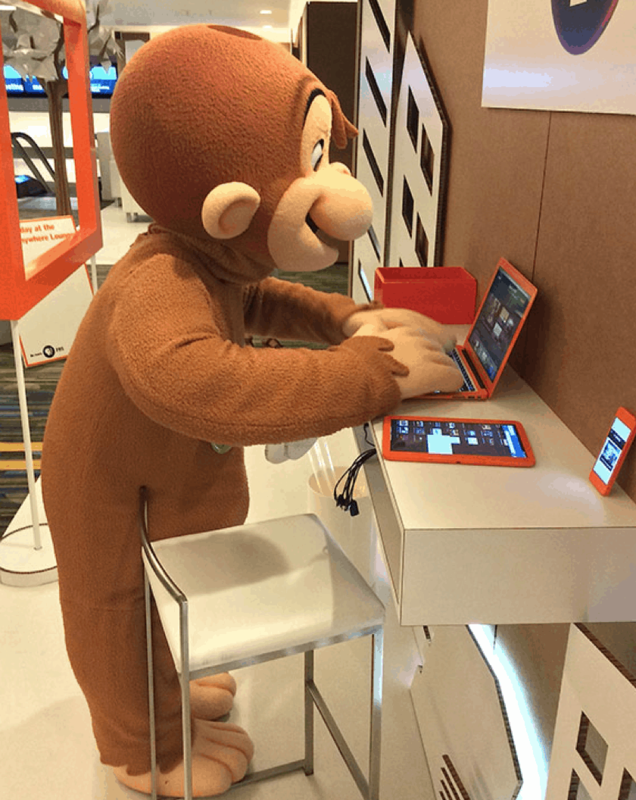 It also gave us room to have some fun, like the time Curious George visited the lounge during its pop-up appearance in San Francisco! What is your favorite part when building a story for a brand? Listening. I love listening to people tell stories about their experience of products or services or experiences with the companies they love. When they’re great stories, it’s rewarding to fish for the little nugget or insight that was the trigger for their decision to choose a particular brand in the first place, then turn that nugget into a story that compels more people to join the fan base. What are some of the differences in design processes for corporate companies versus nonprofit organizations? The design thinkers’ toolbox is the same for anyone who wants to draw on it. The for-profit company and the nonprofit organization may be looking for different outcomes (“buy our product” vs. “donate to our cause,” for example) but in both those cases, they are trying to influence a particular behavior.. Where we sometimes see bigger differences is with nonprofit organizations, where there are more constraints—whether money, time or human resource limitations. When any of these things are in short supply, you need to be especially creative to work your way through a challenge. Constraints lead to greater creativity. Design thinking fuels creativity because it asks us to let go of assumptions, too. So, you can imagine combining this mindset with limited resources—it’s a productive way to get fresh ideas that really break through even in the face of real limitations. Recall one of your favorite experiences when collaborating with a company or person. What did you enjoy about that experience the most? Every time I lead an innovation workshop it’s rewarding. That’s because I get to help people try something new, see something in a new way and be a catalyst for them finding and unleashing their own creative, innovative potential. One of these workshops that comes immediately to mind was the Workshop of Why we led in Chicago. One of the participants was so taken with the experience and the outcomes, he asked me if he could use the same agenda to offer the workshop to his staff and local partners later that spring. He is still leading versions of this workshop today! This feels especially good because his organization and those I work with here are all purpose-driven organizations. We’re always designing toward a higher purpose, which means there will be real benefits for everyday people, like you and me, as a result. This is one of the many reasons I LOVE this kind of work. Thanks for asking! Want to learn more about design thinking? Join us at DC Communicators!